Over the last ten years, I performed all types of professional interpretation: Simultaneous for conferences, consecutive for media events, and whispered for individuals. I also participate in various types of market research settings, providing interpretation for analysts and test subjects. I graduated in Translation and Interpretation in Portuguese and English from Associação Alumni in São Paulo, one of the most reputable schools in Brazil. I keep myself constantly updated through specialization courses and training sessions focusing on Business, Marketing, and Medical topics. At least once a year I attend international conferences held by the main professional associations in the area. 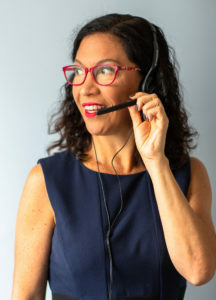 I am member of APIC (Professional Association of Conference Interpreters) and certified member of the ATA (American Translators Association) and Abrates (Brazilian Translators and Interpreters Association) and attend their conferences annually. In 2010, I had the great honor of serving as the interpreter for His Highness Prince Joachim of Denmark during some of the activities in his visit to Brazil as well as His Royal Highness Prince Frederik and Her Royal Highness Princessa Mary in 2012.